My family has made two major moves in the past five years. But with every change, we have taken our financial home with us. Dupaco Community Credit Union is the financial home we know–and that knows us. No matter where we live, Dupaco has our back and continues to grow with us. Direct deposit: We took advantage of this convenience long before our moving adventures began. Home purchase: As we prepared to move from Missouri to Wisconsin, Dupaco’s mortgage department was a quick phone call away when we were ready to purchase our new house. Mortgage refinance: As interest rates continued to plummet, we called Dupaco again to refinance our mortgage. Insurance: Since moving away from Dubuque, we also moved our insurance. Dupaco Insurance Services saved us $200 a year for more coverage than we previously had. We made the switch from the comfort of our home. Online banking: We have 24-7 access to our funds online. 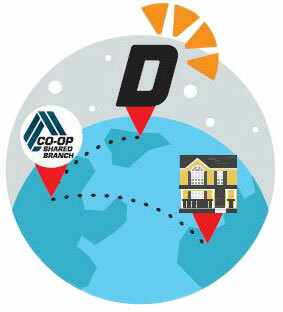 Shared branching: When we need face-to-face service, we take advantage of the Co-Op Shared Branch Network, which offers fee-free access to our money at more than 5,000 branches, many of which are within a few miles of our home. Privileged Status® ATMs: For a cash recharge, we avoid ATM surcharges by using Privileged Status ATMs. Mobile deposit: We deposit the occasional check using my cell phone and Dupaco’s mobile app.